(Location cited as NB 412 563). Bridge, Borve, mid 19th century. A single rubble segmental arch. This bridge carries the A857 public road over the Borve River between the settlements on High Borve (to the NE) and Five Penny Borve (to the SW). The house of Glendale is adjacent (on the E). Information from RCAHMS (RJCM), 29 April 2005. 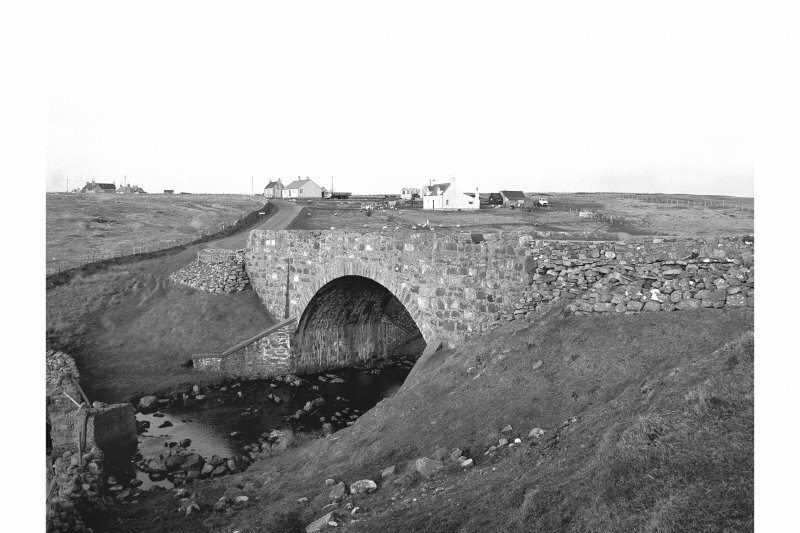 The original 19th century bridge has now been superseded by a new structure situated about 18m to the SE and which now carries the realigned A857 road . The older bridge no longer carries any road traffic and is now blocked by posts (depicted on current OS 1:2500 scale digital map). The 19th century bridge is is not depicted on the 1st Edition of the OS 6-inch map (Island of Lewis, Ross-shire, sheet 5, 1853), which shows only a footbridge and ford. However by the date of publication of the 25-inch scale plan, the bridge is depicted and the road is shown realigned. The site of the ford and stepping stones was approximately 20m upstream from the new bridge. The 25-inch scale map also depicts a series of stepping stones upstream from the ford.